Back from a weekend in D.C. where I kept imagining Sameera, the heroine of First Daughter: Extreme American Makeover (Dutton 2007) gazing down from the solarium on the third floor of the White House. 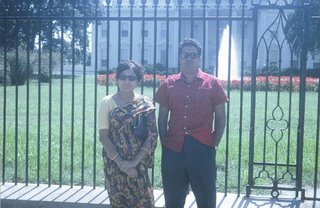 As I tried to identify the languages in the myriad of conversations swirling around me, I thought of our first visit to D.C. about a year after arriving in America (pictured are my parents during that visit in the 1970s -- note the absence of wire across the fence.) Who knew I'd be writing a book years later with 1600 Pennsylvania Avenue as a setting?